Latest price of Lenovo K8 Plus in India was fetched online from Flipkart, Amazon, Snapdeal, Shopclues and Tata Cliq. Increasing number of consumers in India are now looking for feature-packed smartphones that can compete with some of the high-end devices but at an affordable price tag. The category of budget smartphones is now so popular that every other handset brand in India is now going an extra mile to offer tempting features at a pocket-friendly price. Lenovo, the Chinese manufacturer too, is competing with everything it can to improve its market share which has been increasing considerably in the last few years. 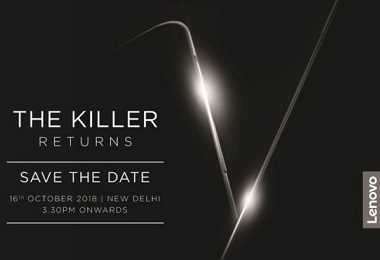 Its latest release is Lenovo K8 Plus which was launched along with Lenovo K8 in the month, of September 2017. On paper, K8 Plus is surely a steal at this price point. The phone comes with a 5.2-inches display, 3GB RAM, and inbuilt storage of 32GB. But what provides it with an edge over other devices in the same price bracket is its dual camera setup, a feature which can only be found in some mid-range and high-end devices. The days of budget smartphones when they used to be shabby and bulky with smaller displays is long gone. There are now a number of pocket-friendly devices that look as good as the ones from a more expensive price bracket and Lenovo K8 Plus is a great example. The phone has a premium metal unibody, and its overall size is just perfect for use with just one hand. On the right, there is Power and Volume buttons with a dedicated Music button on the left. You can also assign this button to another app or feature. The dual-SIM tray along with the SD card slot is also on the left. On the front, it has non-backlit buttons which can be a little hard to use in the dark. The back is home to the dual cameras and LED flash along with fingerprint sensor. At the bottom, there is a 3.5mm headphone jack with speaker grilles on both the sides. Lenovo K8 Plus measures 147.9 x 73.7 x 9mm and has a 5.2-inches IPS LCD Full HD display with a resolution of 1080 x 1920 pixels. The display is protected by Corning Gorilla Glass 3. As compared to other devices of the same size, Lenovo K8 Plus is heavier and weighs 165 grams. A major reason for this is its large 4,000mAh battery. Viewing angles are pretty decent, and even the colour reproduction is very good. The phone features a 13MP as well as a 5MP camera at the back. The 5MP rear shooter helps in measuring depth and works along with the primary 13MP camera to take pictures with improved depth of field effects. On the front, there is an 8MP camera with selfie flash. The camera offers features like phase detection autofocus, face detection, panorama, and HDR. While the dual cameras at the back take amazing pictures in any lighting conditions, the selfie camera struggles a little in low-lighting conditions. Lenovo K8 Plus has a MediaTek octa-core MT6757 Helio P25 processor clocked in at 2.5GHz. As compared to many other devices in the same price range, this phone surely has a much more powerful processor. For graphics, there is a Mali-T880 MP2. The phone has 3GB RAM and internal storage of 32GB which is expandable up to 128GB. It is also available in a 4GB RAM version. The phone runs on stock Android Nougat which is free from most Nougat-related problems found on K8 Note. The company has done a much better job with stock Android this time, and along with powerful processor and GPU, the phone delivers a fluid, lag-free experience in most challenging of tasks. Lenovo K8 Plus is powered by a large 4,000mAh Li-Po battery which is not removable. It offers a standby time of up to 401 hours on a 3G network and talk-time of up to 26 hours on the same network. However, it is important to note that a bigger battery doesn’t always mean better battery life. For instance, Lenovo K8 Note too has a 4,000mAh battery, but a lot of users complained that the phone fails to last more than 15 hours. But things are much better in Lenovo K8 Plus. Most of the users have agreed that the phone easily lasts for more than 24 hours with standard usage. With light use, it is sure to last more than 30-35 hours. Moreover, the phone also supports fast charging and comes with a fast charger. Lenovo K8 Plus has a dedicated slot for microSD card along with two slots for SIM cards. With most budget phones preferring hybrid slots, it is great to see that the phone can be used as a dual-SIM device while also keeping options open for expanding storage. The phone offers a host of connectivity options like Bluetooth, Wi-Fi, hotspot, Wi-Fi Direct, GPS, micro USB and FM radio. It features fingerprint scanner at the back, proximity, gyro, accelerometer, and compass. • Dual rear cameras- Lenovo K8 Plus is one of the few budget phones with dual rear cameras. The cameras help you take pictures with the added depth of field effects. • Excellent design- The ergonomic and sleet metal design of the phone is highly impressive. • Large battery- Lenovo K8 Plus runs on a 4,000mAh battery which again is something that is hardly found on phones in this price range. • Stock Android- The phone is powered by the pure Android Nougat 7.1.1 which is very fluid and offers great overall performance. • Dolby Atmos- The audio output enhanced with this technology to offer an immersive audio-listening experience from the inbuilt speaker or earphones. • No USB Type-C slot- Most phones now come with the latest USB Type-C slot, but Lenovo K8 Plus has micro USB 2.0. • Navigation buttons are not backlit- The navigation buttons on the front are not backlit and can be little confusing to use in the dark. • No support for infrared or NFC- There is no support of infrared or NFC in Lenovo K8 Plus which are features that are now commonly found in many budget phones. • Front camera performance- While the rear cameras are great, the front camera struggles in low-lighting conditions. • Heavy- At 165 grams, Lenovo K8 Plus is one of the heaviest 5.2-inches smartphones.